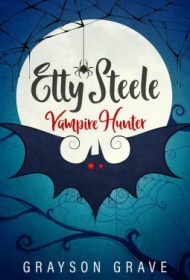 Etty Steele, the scrappy 10-year-old budding vampire hunter and protagonist of this wittingly engaging novel, is a welcome addition to the bloodthirsty literary fantasy world. Etty and her best friend (given the unfortunate name of April Showers) each are coming into their own alter-ego powers. Etty is a vampire hunter and the youngest in a matrilineal succession, while April is just discovering her own heritage as a witch. But because their families strive to blend into their non-fantastical suburban neighborhood and because they are at that painful stage of adolescence, they go to great lengths to disguise their singular talents. Etty remains skeptical, especially after her mother, a merciless vampire hunter who puts Etty through stringent drills, abruptly disappears along with another Form Six student, following rumors of a newly arrived vampire coven. Will Etty’s ethical sense of duty—she refuses to kill without proof of evil intent—overwhelm years of training to exterminate vampires? British author Grayson Grave, a former primary school teacher, clearly knows his middle-reader audience and its challenges. There’s a class bully, a stern but compassionate teacher and the perpetual inconvenience of homework. He embues his characters with relatable strengths and foibles, and Etty is a particularly dynamic, engaging protagonist. The story is a lively combination of action, brisk dialogue and page-turning cliffhangers. A penultimate scene sets the stage for a sequel. Readers will eagerly await Etty’s reappearance in further adventures. Also available as an ebook and audio book.